As you all know, Rachel Platten’s song – Fight Song – has been our anthem. 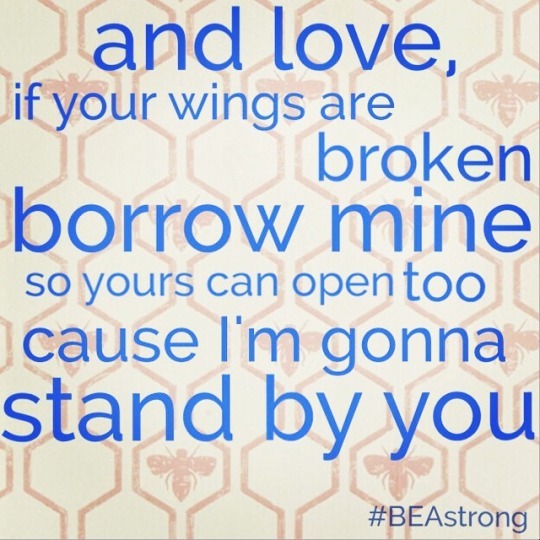 The song has truly been our fight song as we fight for Bea’s health and recovery. I’ve listened to it when I needed a bit of encouragement and when I just needed to hype myself up driving to the hospital. The song has done wonders for our spirits. SO – you can imagine my excitement when I found out that Rachel will be coming to perform in Cincinnati at Q102′s Bosom Ball on October 15th. I about FREAKED OUT when I heard the news on the radio. I will absolutely be attending and will do my hardest to get right in the front so I can rock out LIVE to the song that has done so much for us! AND – Rachel Platten has done it again! Last night she released her new song – Stand by You and, again, it is incredible. This is now on repeat at our house and is our anthem (part 2). Below are the lyrics…download it NOW. You won’t regret it!